“Paddington 2” is “The Godfather Part II” of Peruvian bear movies, a sequel that surpasses the superb original. When the little guy with the floppy red hat and a fondness for orange marmalade first appeared on the feature screen three years ago this month, he seemed like a gift from the movie gods in a traditionally lean season. Now he and his creators have outdone themselves. One lovely sequence finds Paddington inside the London of an antique pop-up book, but lovely sequences keep popping up with remarkable frequency. Some films struggle to fill their running time. This one fairly revels in its joyous inventions. The thread that holds the set pieces together is slender but strong. Paddington, who’s voiced by Ben Whishaw, is enchanted with the pop-up book, so he wants to earn enough money to buy it as a gift for his Aunt Lucy’s 100th birthday. Instead, he’s accused of stealing the one-of- a-kind treasure and goes to prison for a crime he didn’t commit. That plot thread hardly hints, though, at the delicious fun of subsequent events or the quality of the cast, which amounts to a who’s who—and who’s that?—of contemporary English and Irish actors. Paddington’s adoptive family includes, as in the original, Hugh Bonneville as Mr. Brown and Sally Hawkins as Mrs. Brown. (By a twist of Paddington’s fate, Sally Hawkins gets to save him from drowning in an exquisite scene that could have been lifted from “The Shape of Water.”) Jim Broadbent deploys a Mitteleuropa accent as Mr. Gruber, an antique-shop owner. Brendan Gleeson is Knuckles McGinty, a fire-breathing cook with a Popeye voice who serves unswallowable swill to his fellow prisoners. (One moment of transfiguration in the mess hall is worthy of “Ratatouille.”) Hugh Grant steals every frame of every scene he’s in as Phoenix Buchanan, a washed-up stage star of the West End turned loony and larcenous TV pitchman for canned dog food. Some of Grant’s comic turns and pirouettes are close to sublime, and he doesn’t stop topping himself until the last frame of the film. 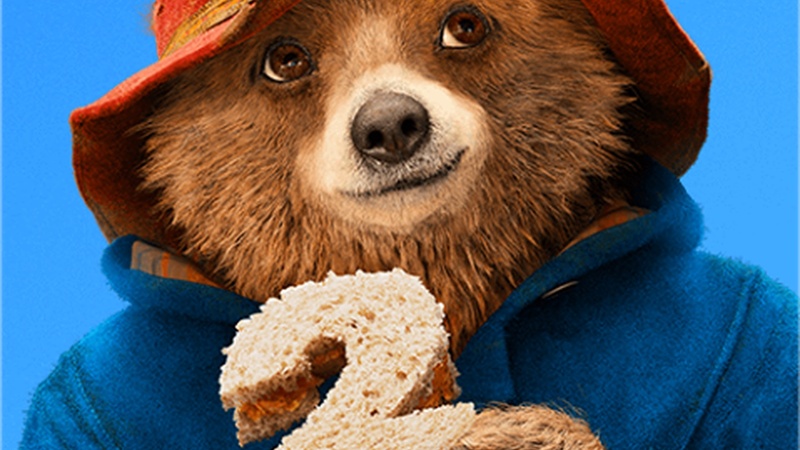 If all of this praise seems too lavish to be credible, let’s stipulate that “Paddington 2” falls short of perfection about 1%—though it could be as much as 1.5%—of the time. For the rest, though, it’s a marvel of animation technology married to impeccable live-action showmanship; there’s a sense of cast and crew working at the top of their games. Like the original, this sequel was produced by David Heyman and directed by Paul King, who wrote the exceedingly witty script with Simon Farnaby. The returning cinematographer and production designer were, respectively, Erik Wilson and Gary Williamson. Thanks to their collaboration, and Paul King’s confident sense of pacing, the film is never rushed, though it’s consistently intense, with visual energy that feels endlessly renewable.